October 1, 2013 October 1, 2013 filipinocavedivers Cool Stuff! In the ideal technical diving world of breathing gases of various combinations, gas mixing facilities and availability of every imaginable equipment, a wide variety of equipment and dive planning configuration can be devised. However, in the real world, logistical and economical considerations come to play. Within the range of air (21% oxygen) diving, with the ppO2 below 1.4 (maximum depth of 55 meters), a combination of 3 11-liter (“resort”) tanks of air for bottom gas and 1 11-liter tank of 100% oxygen for decompression, is the most versatile set up. As noted in this figure, tanks 1, 2 and 3 are air. 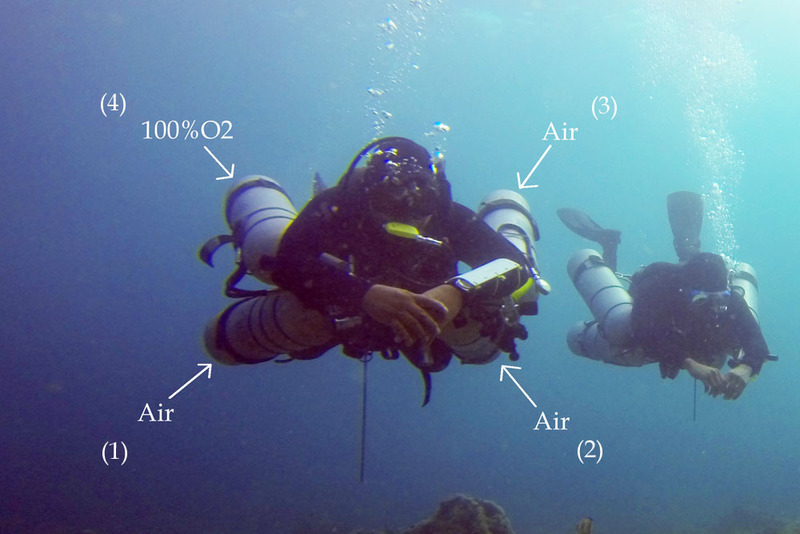 In line with the accepted technical diving rule of “right rich, left lean”, the 100% oxygen tank is clipped on the right top position. (In sidemount diving, the primary bottom tanks are positioned at the bottom, and the other tanks which has the most chance of being unclipped for staging are positioned on top for ease of manipulation). Task loading is the enemy of technical diving. At first glance, carrying 4 11’s seems to be a cumbersome group of tasks. But, repeated exercises reduce the task down to an automatic level, as automatic as carrying a single backmounted tank. Handling of clips, valve manipulations, regulator switches, inflator valve, etc are registered in “muscle memory”. Acknowledgement: Pictured above are FCD divers Andy and Jaime.